No registration accepted at this time. Wrap your head and hands around your imagination! Lots of important info here, so please take your time and read through this page. Reclaim your hands, rediscover your inner artist. Have you always wanted to take pottery lessons? Let me share with you my enthusiasm about the clay’s possibilities here in my potter’s studio. Learn about traditional methods of hand building, pinching, coiling and various slab techniques. Get caught up in the excitement of the potter’s wheel. I’ll guide you through the process of decorating and glazing your work. You will be making pots that you can keep and gift away to friends and family. Ha! It’s dirty work, but someone’s gotta do it! Pottery Books & Tools BEFORE heading to class – there may be some extra tools you’d like to have in hand. Not to worry, I always have tools on hand at the studio as well. Life is meant to be flexible. A deposit of $50 reserves your spot. Space is limited so as to give you lots of personalized attention. $20 cancellation fee if cancelled within 3 weeks of the class start date. you can head to my SHOP where you will be able to send your deposit to secure your spot. CONTACT me to discuss all the possibilities. Classes will run with a minimum of 3 people. Full refund will be provided if the class is cancelled due to enrollment. Additional Pottery Tools can be found here with lots to choose from and there are many available at the studio as well. If you and 3 friends would like to create new date/time for a term of classes, feel free to ask me if I can create a special class for you. Term will run 8 weeks – 1 class/week. If there is room in the class, you may start a class mid term. – Teaching revolves around you. – You will learn Wheel/Throwing & Hand-building and decorating Pottery making techniques. – Dates are subject to change, depending on enrollment. and attend the same chosen class time for the duration of the term. Missed classes: I will do my best to help find a time and space for you to make up the class, however, please understand that just like any other class you may take, it is your responsibility to attend all classes. ~ $25.00 approx. for my “beyond basic tools kit” if required. Additional tools are available for purchase to that are not included in your basic tool kit and can help to augment your basic kit including Chinese glaze/paint/calligraphy brushes. 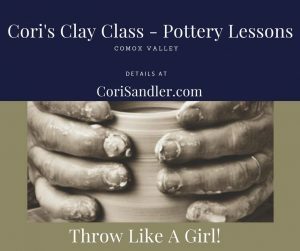 Cori’s Clay Class provides a fun, relaxed and welcoming place to get your creativity mojo working. Learn how to throw on a potter’s wheel, or hand-build. You’ll decorate and glaze your work. With 5 students maximum per class, there is a lot of personal attention. To avoid going over time during class, clean up will begin at least 15 minutes prior to end of class. Please respect class time and be responsible about cleaning up your wheel, glazing and hand building areas within the allotted class time of 2.5 hours start to finish. One class may have students at different levels due to small class size. It’s great to work on your own skills and be inspired by others. Class dates are as outlined above, but we are all human, and I ask you to be flexible, in the event that we have to reschedule a date or postpone a class if needed. Get together in the pottery studio. A one night, 2 hour claytastic time. This is NOT a paint some standard mug thing, but is IS A REAL POTTERY STUDIO. Laugh with your friends as you throwing clay on the potters wheel and hand build some beautiful items that you can pick up after I have fired them for you. You can make YOUR OWN mug or bowl or platter or vase or … lots of options! Here are just a few of the items we can plan to make. Each Girl’s Night is different, and we can tailor an evening just for you and your besties. 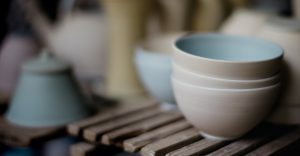 Private classes are a great way to either get started if you have never used the potters wheel before, and also a great option if you just want to brush up on your skills in a very focused environment. Do you live in another city, town, or country? Would you like one on one pottery instruction? Have you seen my live streaming videos on Periscope and want some one on one instruction? 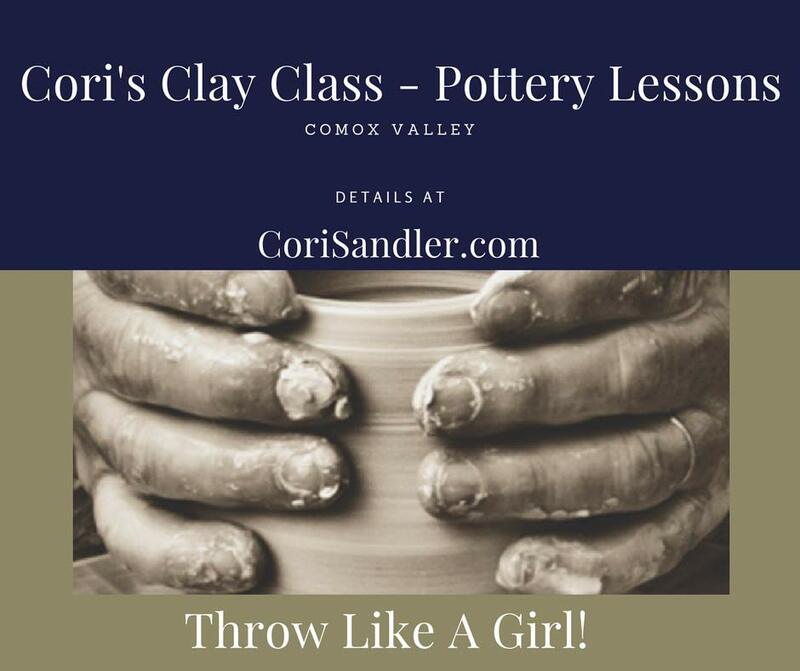 Are you already making pots, but want to get some guidance on your throwing skills or learn a new skills but can’t make it here to Cori’s Clay Class or to a workshop? Skype or FaceTime session are available for just that purpose. Each session is catered to your specific needs. Let’s connect to see how I can best help you out. By clicking on the RED button, you’ll be taken to a form to fill out – it’s just one way that I try to control the spam that can come along with having a website. Thanks for understanding. Do you just want to get down to it? Do you want to hone your skills? 2 day or 3 day workshop (10 – 4:30) each day. You will spend concentrated time working through fundamentals and particulars of throwing on the potters wheel and or hand-building. This is a process based workshop – so you will not be going home with any completed work, but you will be making making making – considering form, technique, altering & trimming. Day 1, you will concentrate on making work – throwing/hand building – depending on your desire. On day 2, 3 we will be trimming work, discussing decorative applications and applying wet slip decoration and slip transfer decoration, mashima or inlay decoration, and texturing decorating techniques on work made on day 1. If you would choose to continue to work on throwing only, that is also completely possible. I am happy to tailor a workshop to your specific needs and wants. This is your time and we can work on specific areas that you are interested in ‘getting down’. If you are coming to Vancouver Island for the first time, you may want to schedule an extra day or two just to take in some of the beauty that I get to live with everyday. Depending on the time of year, you may want to go whale watching, or hiking or take in a summertime music festival. The Comox Valley is one of the most beautiful places I know of. You’ll love it if you are visiting and you already know this to be the truth if you leave here. This level offers an introduction to the potter’s wheel. You will learn how to make a simple round vessel. A cylinder is the foundation shape for almost every other creation made on the potter’s wheel and you will learn how to make this form in various sizes.At the end of the class, you can expect to take home 3-8 finished pieces: this might include mugs, bowls, small lidded pots,egg cups, creamer/sugar, tea light holders and more. You will decorate your pots with varying techniques which may include carving, adding colour using coloured slips, sgraffito or scratching through the coloured slip, and simple glazing.If you are a complete beginners or have limited experience, this level would be appropriate for you. This level is a combination of both worlds. Throwing on a potter’s wheel and free form hand-building utilizing several different methods; coiling, pinching, scraping, soft and hard slab construction. You will learn basic decoration and glazing techniques toward the end of the term. This level would be appropriate for someone who is a complete novice, or one who has taken fewer than 3 pottery classes. This class or level requires that you have taken at least one beginner wheel class. To participate at this level, you’ll require clarity about how to throw a cylinder or bowl and be prepared to practice what you have learned to date. This level will also have you refining your skills in wedging clay, entering, pulling walls and trimming, making and attaching handles – both hand-built and pulled handles. We will work on your abilities to consistently be able to center and control your clay. You will also be asked to keep a sketch book or have drawing references for you to be able to make the shapes you plan to make. Can you easily and comfortably center and throw cylinders and bowls?. Have you begun to explore more complex shapes? If so, then consider this level for yourself. You will divide the term in two parts. 4 weeks of making teapots. Understanding and examining the multiple components which are required in this form. There are several throwing challenges in making a teapot including lids and handles/knobs that both fit physically and visually, spouts that pour and are placed accurately, collaring teapot openings and creating a seat or gallery for the lid to sit in, pulling handles and assembly of all components. The remaining session will be creating a teapot form you have chosen and utilizing all you have learned in the previous weeks. This is an intro to hand-building. You’ll be introduced to basic techniques including pinching, coiling, slab rolling, carving, soft and hard scab construction. With a variety of decorating techniques taught at this level, you’ll learn to bring life to your projects. You will be introduced to painting with coloured slips, and scratching through the slip (scraffito) and basic glazing. You will take on projects that a geared to your experience level. You can work on specific projects offered in class, or you may wish to work on your own projects utilizing methods taught in class. The sample projects shown in each class will vary and may include such items as mugs, bowls, serving platters, wall plaques, plates, pitchers, teapots, candle holders, boxes, vases and small sculptures. Your imagination is the limit in this class. This level is appropriate for all levels of experience. You could be in the gallery next term. Here is an example of some students and their wonderful pots. Get in touch with me to discuss all the possibilities.